Just when you think that 14 years of LEGO movie tie-in games has given you a strong handle on what to expect, Travellers Tales finally goes and throws a massive wrench in the works. 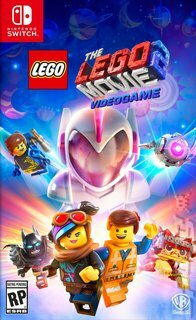 If you were expecting the LEGO Movie 2 Videogame to be another low stress action adventure game roughly following the plot of the movie through a series of story missions mixing light combat, platforming and puzzling, you're in for a surprise. It should be a welcome one, though! Alien invaders have busted up Bricksburg big time, leaving what looks like a box of random LEGO bricks bought from a charity shop in their wake. Now Emmet and a host of other characters (and there are over 100 playable characters in total) to journey out into the solar system and save their pals. What this sets up isn't the slight upgrade to the last LEGO Movie game that you'd expect, however, but rather an open world game of exploration and building more akin to LEGO Worlds than a LEGO Batman game. Players wander from planet to planet, completing quests and amassing relics and master pieces. Some of the missions will advance the game's story, while side missions will see characters asking you to construct items, paint objects or construct buildings. As you go, you'll collect tools such as construction booklets; item scanners that put new objects in your catalogue, power gloves to smash up scenery, paint brushes to add your own touch to structures and more! You'll even get to spend time on Syspocalypstar, a special world that the player can customise and build on as they go, buying specialised pieces to really make it their own. It's a formula that pushes the fun and weirdness of previous LEGO games to new heights, with much more room for creativity and massive boss fights scaled up to match it!